I have a '71 Pontiac station wagon. A while back I sent my POA to be reconfigured for 134, changed to a parallel flow condenser and added a Pro 6 Ten compressor. The car would run hot (455 bored .60 may be the problem) when the A/C was turned on, but never ran hot otherwise. I would like to change the mechanical fan on the engine to an electric puller fan. I'll make my own shroud. I believe the correct operation of this fan should be that it comes on only when a particular temperature has been reached. I would also like to add a pusher fan in front of the rad/condenser. I believe the operation of this fan should be that it comes on any time the A/C is turned on. This car, of course, has no computer. Is my assessment of when and how the fans should operate correct? I am unaware of how to wire and make this setup operational and would appreciate instruction. 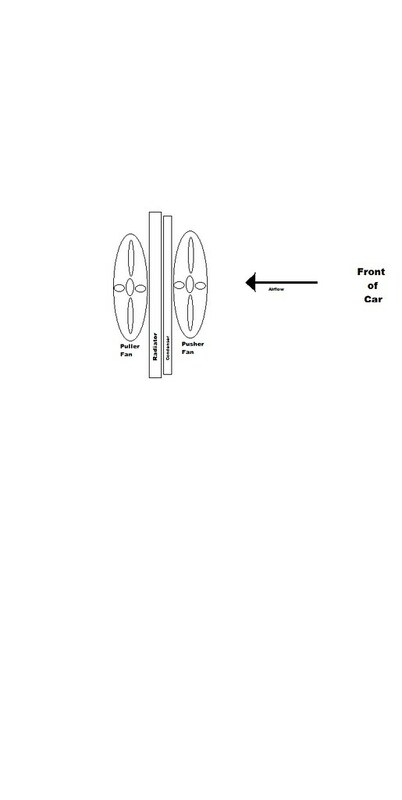 Here is a small picture to help visualize my desired physical setup. As Lou said Surprising how much a Good Clutch Fan And Shroud Will help in Cooling. There are many good aftermarket set ups for pusher fans. Also make sure you have a Good flowing Radiator. With a Pontiac 455 a three core ,( in my humble opinion) is minimum.